John Gribble  celebrated his 80th birthday on August 14th, 1953. For 37 years (starting in 1906) he was the cashier with the Canadian Copper company. He was born in West Tolgus, Cornwall, England on August 14, 1873, and his education began at Illogan’s Boys School. From the 1881 Census of England and Wales, Illogan, Cornwall, were William Gribble, age 37, Tin Miner, his wife Elizabeth A. Jenkins, age 37, born in Redruth, Cornwall, sons William C., age 14, George H., age 9, John, age 7 and stepmother Ann Gribble, age 58, born in Redruth, Cornwall. John came to visit his brother in 1895 and started work with the Canadian Copper Company on June 14th. He started as a drill helper at the No. 1 Mine, but six months later became timekeeper in the Evans Mine, then a year after that was called to the General Office. Since 1907 he has been cashier. He worked for the company for 41 years. The Inco Triangle November 1952. 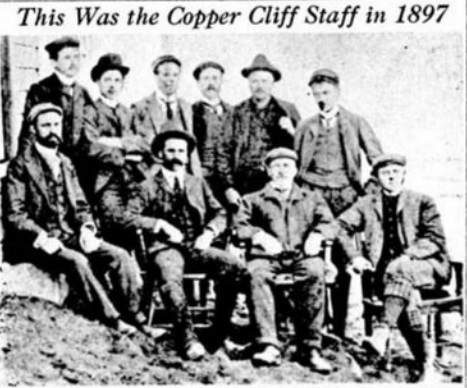 This historical photo from the souvenirs of John Gribble, retired Inco cashier now residing in Sudbury, shows the office staff of the Canadian Copper Co. at Copper Cliff in 1897. In the back row, left to right, are F. P. Bernhard, John Gribble, J. G. Oliver, Wm. Telford, T. N. Kilpatrick (smelter superintendent) and F. S. Jordan; in the front row, L. H. Thullen (master mechanic), John Lawson (mines superintendent), James McArthur (general manager), and A. P. Turner, later company president. As far as can be learned, only two of the group have not passed on. F. P. Bernhard, who is retired on pension after many years as comptroller at the Company's New York office, and John Gribble. In August of 1901, John married, and his wife (Sara McGee) died a year later. See Events - Wedding Bells. In 1906, he met Eva Lavina Bond, a nurse who graduated from Victoria Hospital of London. They were married September 10, 1908 at Caradoc, Middlesex, Ontario. Their first home was on a short street, off Serpentine, later called Gribble St., after the family. John and 'Ava' had three daughters and one son. From the 1911 Census of Park Street, Copper Cliff, Nipissing District, John Gribble, married, age 37, born August 1873 in England, Immigration in 1895, Cashier, his wife Eva L., age 31, their daughter Ruby S. L., age 7, born October 1903 and George E., age 4, born January 1910. John was a chorister in Cornwall when he was so small he had to stand on a chair to be seen and heard. A musician of skill, he has been actively interested in the musical organizations of the nickel district and few of them do not bear the imprint of his influence and enthusiasm. Two or three days after his arrival in Copper Cliff he was the community's official organist, presided at all consoles regardless of denomination. Six months of such service found the town so appreciative that, at a surprise party in the Hambley home at Evans Mine, Catholic and Protestant congregations combined to present him with a handsome gold watch. In 1918 he transferred to the choir of St. Andrew's Church, Sudbury, became organist until the arrival of E. B. Beattie. Returning to Copper Cliff, he was at the United Church console until 1931, and conducted the 97th Regimental Band. The Copper Cliff Reed and Brass Band, The Sudbury Star May 23, 1914. Back Row - Capt. Hambley, A. Laxo, W. Gravel, E. B. Morse, J. Harju, W. Braybon, A. Bertrand, C. D. Welch. Second Row - B. Trestrail, J. Follansbe, I. Koski, R. Olandale, N. Nicholsen, J. Wilson, Eddie Bell. Third Row - E. Osser, C. Feldhans, A. Trestrail, John Gribble (conductor), G. Trestrail, Roy Barnes, W. Craig, Brodie Brown (secretary). 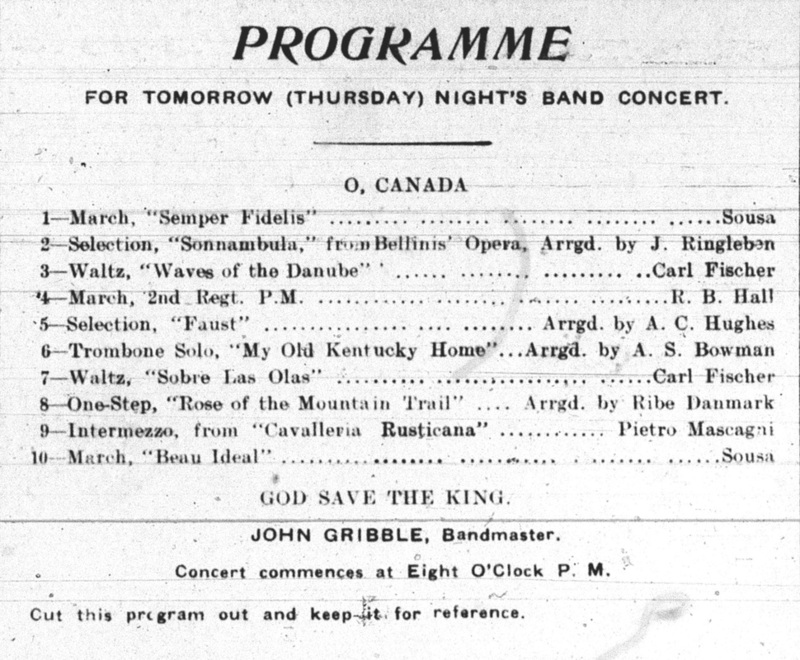 The Copper Cliff Band was playing at all the sessions at the Palace Roller Rink in Sudbury, which was operated by W. H. Clubb of Parry Sound (August 1910). 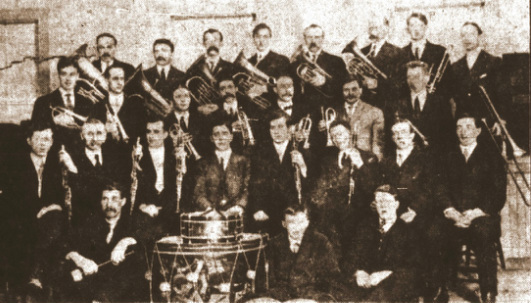 The Copper Cliff Reed and Brass Band was organized in August, 1913, getting off to a good start by the generous assistance of a grant of $500. from the municipal council, which amount was further augmented by a similar grant of $500. from the Canadian Copper Company, which was used in the purchase of all new instruments. Mr. John Gribble became bandmaster and it is largely due to his knowledge and direction that the organization has attained its present high plane of perfection. President Ambrose Monell of the Canadian Copper Company liked John Gribble’s band so much he told him to order the best uniforms money could buy and send him the bill. That was the new Copper Cliff Reed and Brass Band of 13 pieces. The prime organizers were John Gribble, Dr. H. Feldhans, A. D. Miles, Cap Hambley and W. Brayton. In June of 1914 President Ambrose Monell presented the Copper Cliff Band with new navy blue uniforms, trimmed with black braid and with a gold lyre worked on the collars. In July of 1917 at the annual meeting of the Copper Cliff Band, George Craig was inducted as president, Capt. W. Hambley, vice-president, John Gribble, bandmaster, Harry Ryder, assistant bandmaster, George Burn librarian, Thomas Scott, secretary-treasurer and Wilson Jackson, janitor of the band hall. The funeral took place of an almost lifelong member, firstly of the Copper Cliff Reed and Brass Band and more recently of the 97th Algonquin Rifles Band, in the person of the late Samuel Lahti, on Sunday afternoon last, with all honors due a talented and devoted bandsman, one who had given a large part of his life and much time to musical matters in Copper Cliff. Deceased had been ill for about three weeks but only three or four days before his death was he taken to his bed with typhoid fever, having taken suddenly ill at his place of business, where he worked for many years as a shoe repairer. He had been a member of the band since its inception and at the time of his death was a solo altoist of no mean ability. His fellow bandmen turned out almost to a man on Sunday and played the funeral as far as the town limits. At the point of leaving, after having played "Webster's Funeral March" and the "Dead March in Saul" en route, the band lined up on either side of the road and stood at salute while the funeral cortege passed by. Interment took place in Eyre cemetery. Rev. D. A. Johnston officiating at the grave, as he also did at the service held in the Finnish Lutheran Church held prior to leaving Copper Cliff. Six of deceased former colleagues of the band acted as pall bearers. A wife and four children are left. "Then there was the Copper Cliff band that went to Webbwood to a funeral. The local train landed them there two hours ahead of time to play. Nothing to do but practice the proper poise for the sad occasion. Somehow they strayed from their good intentions and spent some time 'oiling up; - the instruments, of course. By the time the music was called for they were all playing different dirges. The climax came when the coffin was lowered and the bass trumpeter fell off his bass and fell headlong into the pit." The Copper Cliff Miners Band 1900. City of Greater Sudbury Heritage Museums Collection.